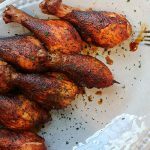 I love this meal for many reasons: it’s simple, it’s budget friendly (the whole meal is under ten bucks), and these are without question some of the best drumsticks you’ll ever eat. Notice I said “some of the best” because the absolute best are my mother’s southern fried drumsticks that I have, despite years of attempts, not been able to master. [Mom, if you’re reading this, that’s a huge hint that I would like you to visit again soon and throw down some of those masterpieces.] In any case, when time and/or budget are limited, there’s no need to limit the flavor as well. This is a great meal for any night of the week or for your next neighborhood cookout. Step 1: Remove chicken from its packaging. Rinse and pat dry with a paper towel. It’s important to get as much water off the skin as possible because water will steam the skin, making it rubbery. Rubber chicken skin is about the grossest thing on the planet—next to lima beans. Step 2: Place drumsticks on a board and lightly dust them with baking powder. Return to refrigerator for 2 hours. This will help to draw additional moisture out of the skin, which helps the drumsticks crisp in the cooker. Step 3: Light your grill or smoker and set it up for indirect heat, establishing temp at 325 degrees to 350 degrees. 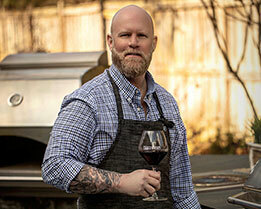 I use the Primo ceramic grill, but you can use whatever cooker you have available. Step 4: Spray drumsticks lightly with olive oil spray. This is not only to bind the rub, but also helps with crisping the skin. Again, the more we can do to avoid rubbery chicken skin the better. Step 5: Generously coat the chicken legs with rub. 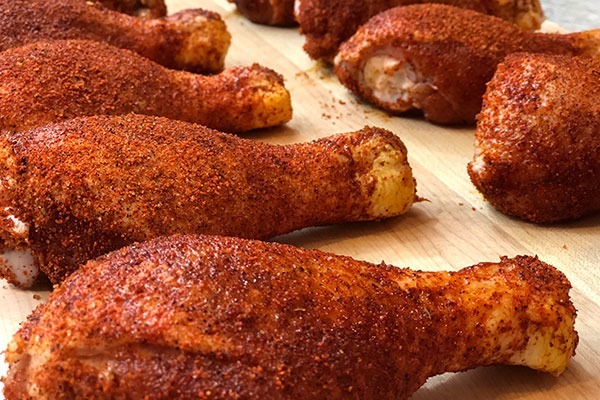 I use Code 3 Spices 5-0 rub, but feel free to substitute your favorite BBQ rub. Ensure you rotate drumsticks so that all sides get coated. Step 6: Set up your drumstick rack and place the ends of the drumsticks in the notches, hanging them upside down. I use a rack I bought on Amazon because of the catch tray. If you don’t have one with a catch tray, you can use a baking sheet as a catch tray. You’ll need to collect the juices to make our glaze. Step 7: Add one or two wood chunks to your coals. 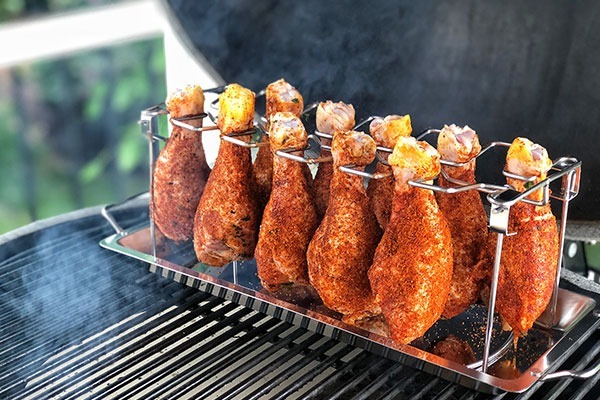 Pecan or apple wood chunks go well with chicken. Step 8: Place the rack in the indirect heat section of your grill. Step 9: Close the cooker lid and allow chicken to cook for about 1 hour or until internal temperature is 165 degrees. Step 10: At 165 degrees pull chicken off the smoker. Step 11: Pour drippings into a small bowl, whisking in honey and one additional teaspoon of rub to create the glaze. Step 12: Lightly brush or drizzle glaze onto drumsticks being careful not to scrape off any of the rub. Step 13: Let sit for 5 minutes, garnish and serve. Remove chicken from its packaging; rinse and pat dry with a paper towel. 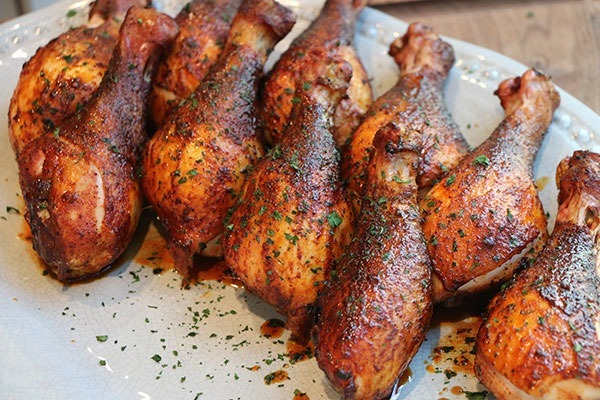 Place drumsticks on a board and lightly dust them with baking powder. Return to refrigerator for 2 hours. Spray drumsticks lightly with olive oil spray. 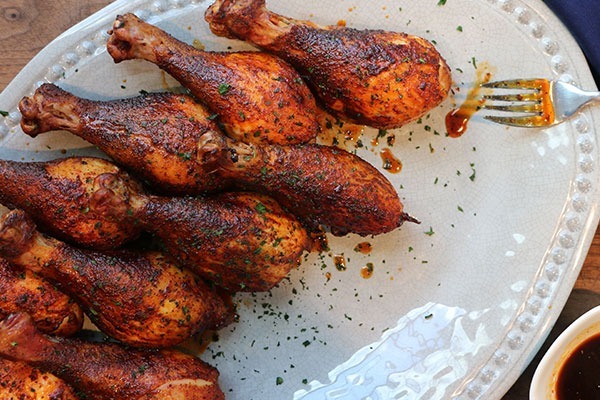 Generously coat the chicken legs with rub. 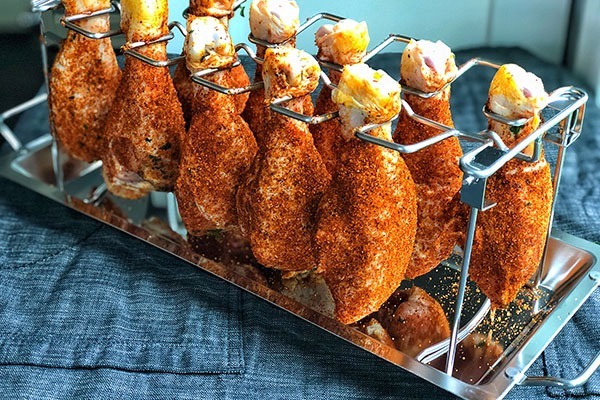 Set up your drumstick rack and place the end of the drumsticks in the notches, hanging them upside down over rack pan. Add one or two wood chunks to your coals. Place the rack on the indirect heat section of your grill. Close the cooker lid and allow chicken to cook for about an hour or until internal temperature is 165 degrees. 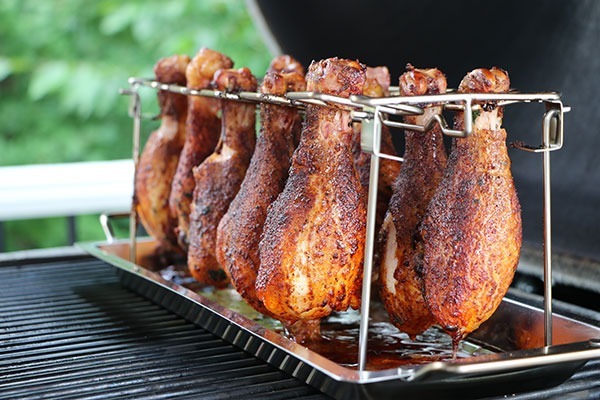 Pull chicken off the smoker and pour juices from drip pan into small bowl and whisk in honey and 1 teaspoon of rub. 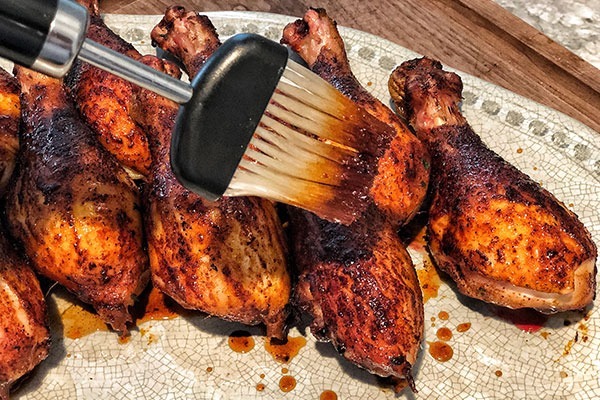 Glaze drumsticks with brush or drizzle it on with a spoon. Let glaze set for 5 minutes, garnish and serve.